Whenever I think of interfaith relationships as it pertains to Pagan and X, I'm reminded of all the horror stories I've been told. Friends who were afraid to tell their significant other about their religion until marriage only to find their relationship on the rocks. People who get along well enough with their religions but still suffer from the occasional nag or nit pick. In fact, my best friend's little sister suffered turmoil in her young relationship because of her pagan beliefs and, eventually, that relationship was terminated. Among a sea of unfortunate circumstances and relationships that suffer, I feel like my story stands out. I'm here to offer a positive spin on what seems to be a sensitive subject. 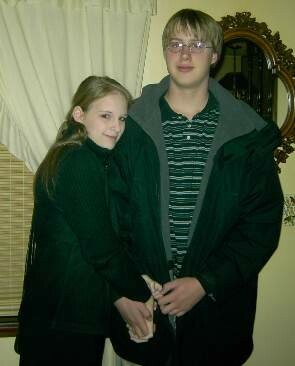 This is my husband and I roughly ten years ago. We met my junior, his sophomore year of high school and it was love at first sight. Perhaps that's what's made my interfaith relationship so easy. You see, my husband is Catholic. Yes, you heard me right: Catholic with a capital C. His faith is strongly rooted too. Our second date was his confirmation and, in the picture above, we're heading off to a church dance hosted by one of his parents' churches. Our relationship has never been affected negatively by either of our faiths. Neither of us has ever once encouraged the other to convert or mocked one another's belief system. In fact, I'm the one that wakes him up early on Sundays for church and he's the one that captures many of the photos during ritual for this blog. We both are incredibly encouraging, and I think that stems from a few factors. One: I did not have a negative experience with Christianity. My conversion to paganism wasn't fueled by a disdain for the church. In fact, I quite loved Sunday school growing up. I just lacked a connection that I get from a more interactive religion. For more on how I chose my religion, see my post on Pagan Coming Out Day. Two: Both of us are heavily educated in the other's beliefs. I spent part of my illustration degree taking theology courses, including Old and New Testament classes. I find the stories and interpretations fascinating. In addition, my husband has discussed his beliefs in relation to his church and the Bible extensively. I've even attended a few services at his church. Likewise, my husband has not only heard my numerous monologues regarding my pagan beliefs but has witnessed firsthand rituals and ritual building. He knows I'm not out casting hexes or sacrificing animals. His use of the camera has meant that he's participating, even at the sidelines, in most of my rituals. There's also probably a third factor that's a little less rational than the above two: We're soul mates. 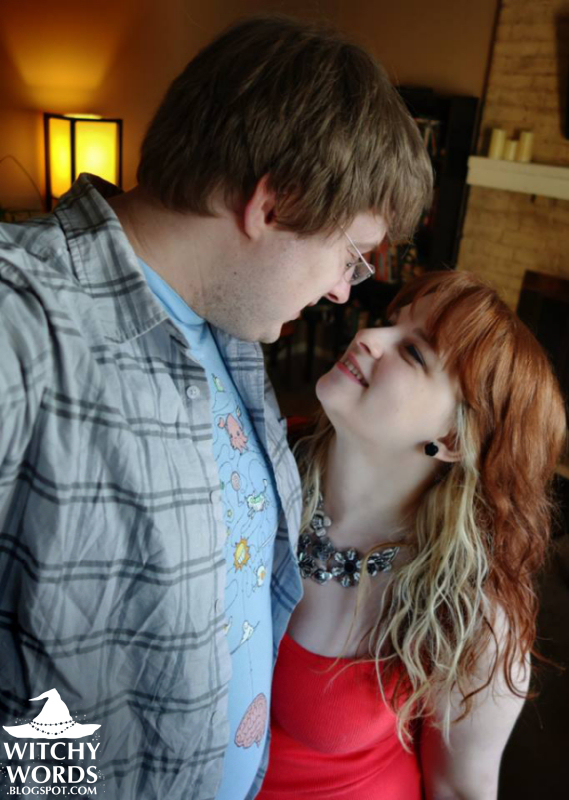 Aaron and I have been together since I was 15, and married since I was 20. This upcoming September 2013 marks our 5th wedding anniversary and May 2014 marks 10 years of dating. In that time, we've grown together. We've managed to survive two high school graduations, two college graduations, loss of job twice, loss of apartment once and hitting severe rock bottom. Not to say that we've had it harder than other couples, of course, but more to prove that we're not just in it for when things are good. If we can manage all of that, a little religious difference seem hardly important in the bigger scheme of our relationship. Actually, we recently rented a new apartment together. Aaron didn't have to ask me what I needed to do: he instinctively knew and came home this morning with a new broom. Before moving anything into the apartment, it needed a good cleansing. He aided me in setting everything up, figuring out the directions and cleaning up after we were done. He's actually letting me commandeer one of the bedrooms to make into a spiritual room. This is a room he probably won't frequent, but it definitely shows his level of commitment to supporting me in my religious practices. Particularly since they aren't his own, I find this both impressive and enlightening. Unfortunately, it's been a while since we've really taken a picture together, so enjoy this one from earlier this year when we decided to randomly walk a mile in a foot of snow for brownies. Because brownies, and true love, are worth it. 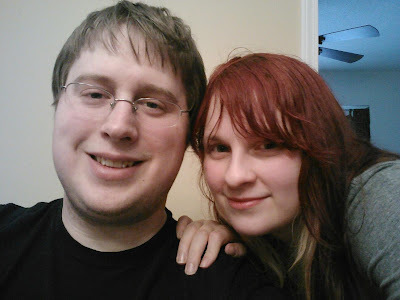 Update 5/4/14 (our 10 year anniversary! ): A better picture of us! that is a beautiful story, I am soooo very happy for you. Would you maybe consider doing a post for people who have someone in their life that is afraid to have them practice in their home because they are afraid they will call up some demonic entity or such thing, could you maybe speak to how your overcame any fear of that or tell of how the craft is safe to practice and how to practice safely so as not to cause anything horrible to happen and is it even possible, for that sort of thing to happen if you have only good and honorable intent. thank you so much for sharing so generously with us all. Thank you so much! And thank you for your topic suggestion! I will definitely write on that. Look for the post soon! The post has been made!